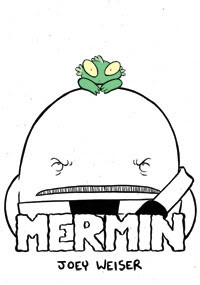 Mermin's adventures on land continues as we pick up the story from the cliffhanger ending of the last issue. With a friend's life possibly on the line, Mermin must choose fight or flight. Will he risk his new freedom to keep innocents safe? The action kicks into high gear this time as Mermin comes face to face with those who want to return him to his old life. There's quite a bit of battling going on as this chapter in the story serves mostly as a way to set up what I expect to be some big revelations. We get to see Mermin in action again, with Weiser once more doing a very good job of keeping the fighting looking fluid while not losing the cute style that defines his characters. Despite the shortness of the comic itself, it feels like we get the full story of the battle, which I also appreciate. I suspected that there was more to Mermin than meets the eye when I reviewed the first three issues, and that's playing out her, even as the characters within the comic come to the same conclusion in a brief interlude. What neither they (nor I) can figure out is what that "more" is, and I'm eagerly looking forward to finding out, possibly as soon as the next issue. For a person who mostly writes in full-book form, I think Weiser captures the magic of an ongoing series well. He's giving complete stories within the issues, leaving the reader wanting more each time with a cliffhanger, and the whole thing, at least so far, hangs together really well. Now is a great time to get started reading Mermin, as Weiser has a bundle special for the holidays. I definitely recommend this one for fans of mini-comics and serial storytelling.